While I have been back from the Summer Rhythm Renewal for several days, it's been difficult for me to put this recent adventure into words because any time I am affected on a deep emotional level, it seems like nothing I can say will truly express what I experienced. I'll start like this- my friend Jim Donovan puts on one hell of a shindig. 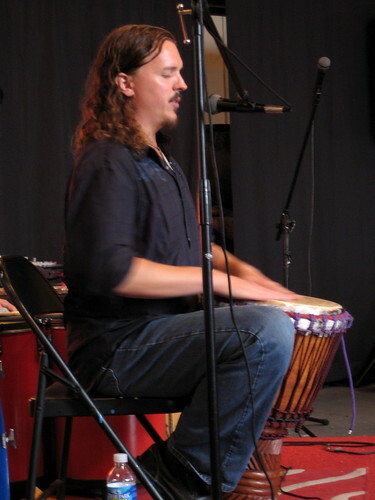 The Rhythm Renewal is a multi-day event held on campus at a local university in the mountains of Central Pennsylvania. On the surface, it's an interactive experience filled with classes and workshops on various types of hand drumming and dance. When you look a little closer, you will find an underlying theme of spirituality and self expression with workshops such as "The Yoga of Drum and Chant," shamanic journeying, and mandala creation. You are surrounded by about 100 like minded people and when you want to experience something that's new to you, you are surrounded by a positive loving energy that encourages you to be open to experience new things. This is a SAFE environment and no one will ever judge you for any reason - not for the sound quality of your voice, or how well you can play the drum. While I can't speak for everyone, I can say that I know that in my day-to-day life that I am not always surrounded by the motivation and encouragement that I feel from my friends at the Rhythm Renewal, and it always creates a significant amount of self reflection upon my return. It makes me think about how important it is to position yourself in life to be surrounded by like minded people and to remove different aspects of your life that aren't serving your highest good because we deserve to feel this good about life ALL OF THE TIME. This year was the first time I had been invited to be a member of the faculty at the Renewal. Jim had been commenting on how I should maybe teach people to create the mandalas that I am always drawing and I half jokingly suggested that he let me do it at the Rhythm Renewal. Without skipping a beat he said just one word - "Done." And so, I spent the last few months working out the details on how I would present this material to the participants. My class which was entitled, "Mandala: An Artful Creation" was part of a break out session - meaning that I was presenting one of four workshops over the same time period. I had no idea what to expect by way of attendance. 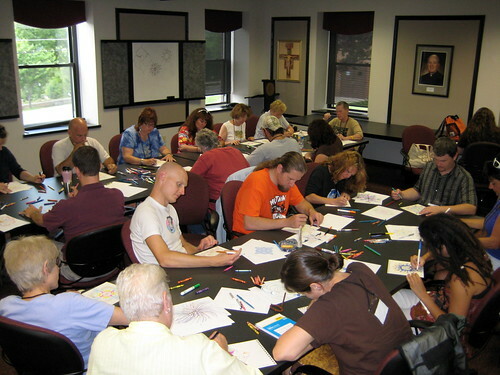 I was guessing that since an "art" class was so different from the rest of the offerings, that I might get 5-8 people in each class but I was wrong. I had done my best to spread the word that this wasn't specifically an "art" class, but one more about personal expression and that there would be no judgment with what people created. I ended up averaging 20 people per class over each of the three days and that made me supremely happy. 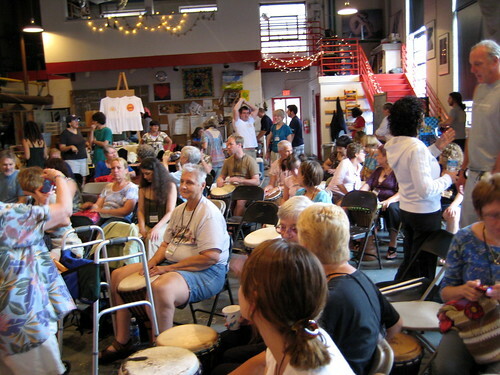 This year's Renewal schedule was packed with lots of high energy drum and dance workshops and it seemed that people appreciated an outlet in which they could decompress and regain their focus. In each class we did an individual piece and also a group creation. People seemed to be enjoying themselves and there was a fair amount of talk from people that weren't used to creating art on a regular basis saying that this was something that they felt was easy and accessible to them. One woman went as far as to drive off campus after the first class to get herself a set of markers so she could continue to create during the rest of her stay. Another woman told me how she was going to go home and paint huge mandalas on the walls of her house - but one story I heard moved me like no other. There was a 67 year old woman in the class that told me that this was the first time in 40 years that she had created art because she had always felt that it was something that she had to wait until retirement to do. 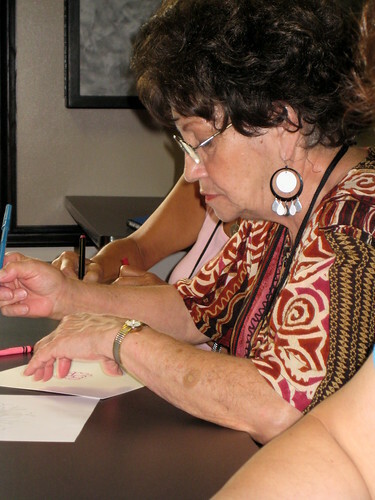 I was so honored that she chose my class to start creating again. Aside from my teaching experiences at the Renewal, I am always so happy to be surrounded by all of my old friends from years past, as well as meeting wonderful new people. Jim always encourages us all to talk to people - that "you never know who your best friend is going to be." And so allow me to introduce my new best friend, Jaqui MacMillan. 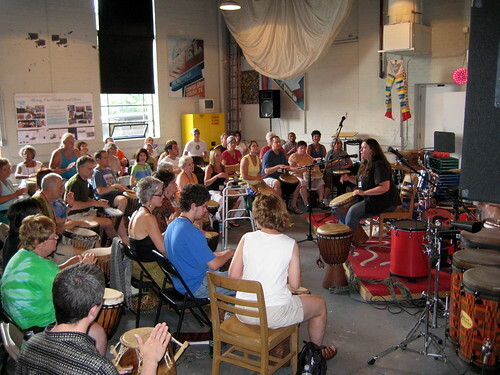 Last year when I was in Pittsburgh for Drum Talk, my friend Mike Deaton said to me - "You really remind me of my friend Jaqui MacMillan..." Then low and behold, she's also a first timer on the faculty at this year's Rhythm Renewal. 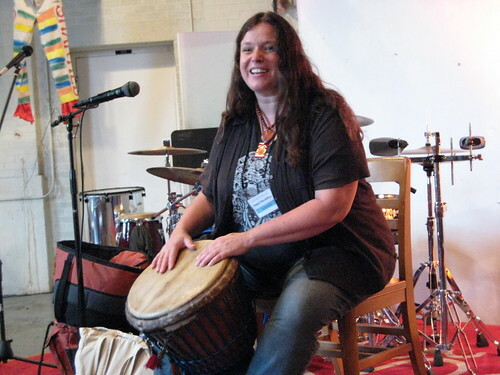 While I was a newbie in the sense that I was teaching my workshop for the very first time, Jaqui's been playing djembe for 27 years and teaching for 18 so she was no stranger to teaching at her first Renewal. She has a more than impressive resume that upon first glance can be quite intimidating - but when you meet her you are immediately put at ease by her beautiful smile and brilliant energy. With no disrespect to my other teachers, her teaching style is on point. She makes everything so simple, simple, simple, and completely accessible to people at any skill level. She was a wonderful addition to the already outstanding faculty and has been asked to be back on next year's staff, which makes me very happy. With Jaqui, I seemed to have one of those, "seems like I already knew her" kinds of experiences. I had the great fortune to spend time with her talking about anything and everything and we had a blast. The really strange part of all this is how we seem to resemble each other. At least a dozen people commented on this over the weekend and so as far as I'm concerned, not only to I have a new friend, but a new big sister as well. Over the course of these five days I drummed, danced, chanted, drew sidewalk mandalas, encouraged others to let go and generally had a phenomenal time with some of the best people in the world but readjusting to daily life after such a transformational event can be a little tricky. You bring all that joy back with you - you ride the love bubble home and then you remember that you have bills to pay, and dishes and laundry to do. People around you in your life outside the Renewal won't always understand what that glassy look in your eyes means, or how it really is, "all good." But you take a deep breath, close your eyes and go back there for a few moments, if only in your mind. It is a challenge to stay in that frame of mind once you get home, but when you realize that by examining your life that you can make choices to remove things from your life that don't serve you and replace them with things than can, you will find that those ecstatic moments can last much, much longer than just a few days. By being diligent with creating your world around you, you can lead a truly ecstatic life. Chalk mandala created by me, Mike Deaton & Jordan outside the Boilerhouse. 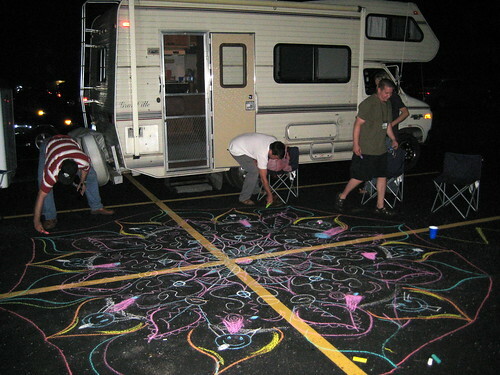 Late night parking lot mandala where everyone contributed. It reached ginormous proportions. PS: A big THANK YOU to Jim for giving me the opportunity to teach my class, to Karen Doherty at Exaclair for providing Clairefontaine Watercolor Pads to be used in the class, and to my friend Donna who couldn't come to the Renewal this year, but who so graciously donated a large portion of the supplies (markers, chalk) that we used over the weekend. Much love! This is all so right on! And I never would have known that you and Jacqui had just met!!! That's so funny -- a woman at the Renewal said the same thing about Rhei C. and I...she thought we were friends from childhood, but we'd only met last year and this is only the fourth time we'd spent time together. Thanks for sharing your thoughts on the experience! I've never drummed, but it sounds remarkably like the burst of creativity writers feel after coming home from a conference. Empowerment! Wow. That looks like so much fun. I wish I could have been there! Great post Steph! Glad to hear you had such a great experience. Wow, that sounds like such an amazing experience... it must have been a great feeling to be able to transmit your enthusiasm and knowledge to so many willing people, at the same time as being in such a positive creative environment for your own growth. Sounds like the perfect mix! Between reading your blog and reading some of Jung's work I've started making mandalas too, and I'm beginning to get an inkling of how they can work spiritually as well as creatively... it's been a very fun learning experience. Love the chalk mandalas - and the bell belt!! Hi Biffybeans, I've only followed your blog for a short time but I really enjoy reading your reviews of pens and paper and all of your mandalas. I'm still not sure *what* a mandala is (I almost wish I had been able to take your class!). 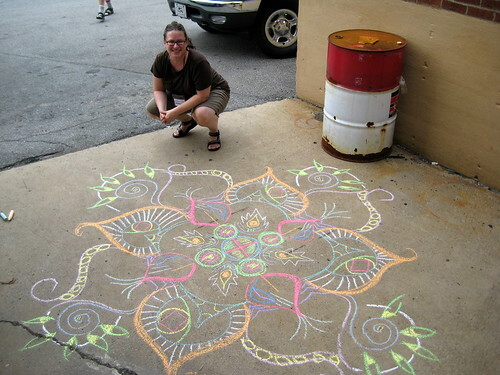 I love how colorful everything is, especially the chalk mandalas. Seeing one of those on the street would make me smile! 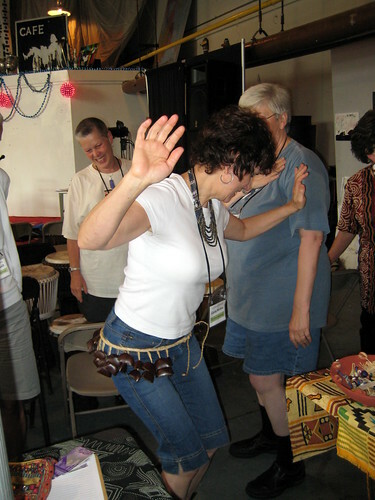 Kathy - You are more than welcome, and I'm glad you also had a great time at the Renewal! Beth - everyone should drum! Anyone can do it and when you do it in a group environment, the experience is all the more intense. Kim - it was fantastic. Maybe you could come to next year's event? Stacy - Thank you very much! AJ - Thank you! It was wonderful. Unhalfbricking - Thank you - it was an honor to share what I've learned with the most wonderful people. Glad to hear that you have also been making them! Denise - yes, you should definitely come! 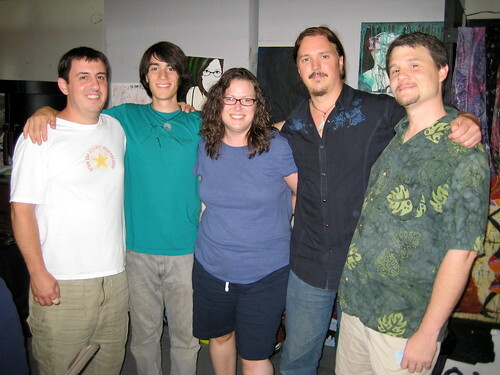 Stephanie - Thank you for reading my blog! Mandala is a Sanskit word that loosely interpreted, means "circle" or "wholeness." I typically define a mandala as a circular design that starts at the center and radiates outward in symmetrical concentric patterns. A great summary of your retreat and the lessons you brought home from it! Congratulations on your first teaching experience there. I hope you will have many more opportunities - you're a natural. Why? Because you include the how and why, and not just the what. Adored your description of the impact of this creative weekend. Congrats on leading the mandala class, I'm curious to learn how you guided the creative process. 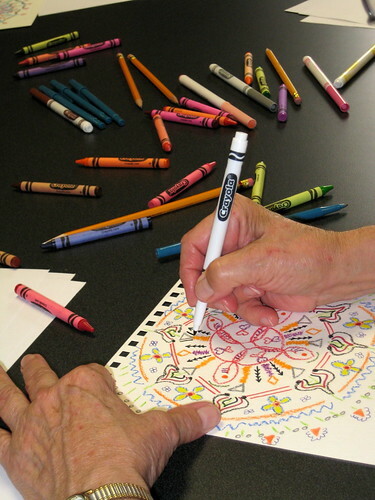 Your enthusiasm for art and mandalas is inspiring. I too, really enjoyed your post. What a rejuvinating weekend! I am not surprised you had 20+ participants per break out! I had never made a mandala until I found your blog, and find it a wonderful way to wind down at the end of the day...which I guess is meditation for me! Thank you for spreading your joy! 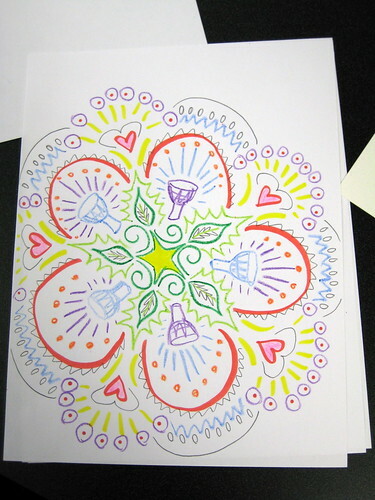 I drew mandalas with my niece this past weekend and thought of you! Marsha - thank you so much - what a kind thing to say! SMR - Here is pretty much all you need. I see mandalas as being concentric symmetrical patterns that move outward from a central point. Start at the center and work outward, doing one pattern around the circle at a time. As this is meant to be a meditative process and not an art session, the biggest thing to remember is to release your judgments on what the finished product may look like. This exercise is about the doing - not the end result. Gypsy - thank you very much! In the class, I felt the most important thing was just to let people know that they were in a safe space and that there would be no judgments on the quality of what they were doing. Plo - Thank You! Keep making those mandalas! Notebook Stories - Yaaaaay!!!! And thank you! Monetizing one's art - What would you do?